Ever wanted to host your own Thanksgiving celebration, but been too afraid to try. Sure you can make a mean broiled chicken breast, but roasting a whole bird, let alone a turkey, can scare the stuffing out of anyone! Well fear no more! 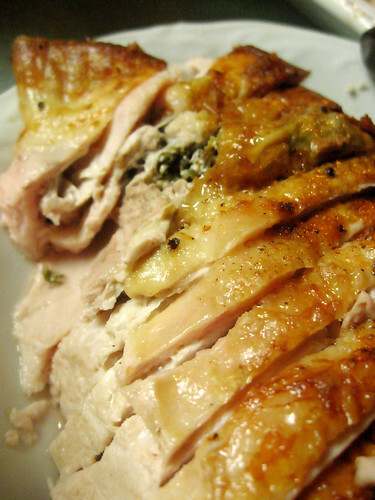 Roasting poultry from start to finish, including brining, stuffing, seasoning and basting! 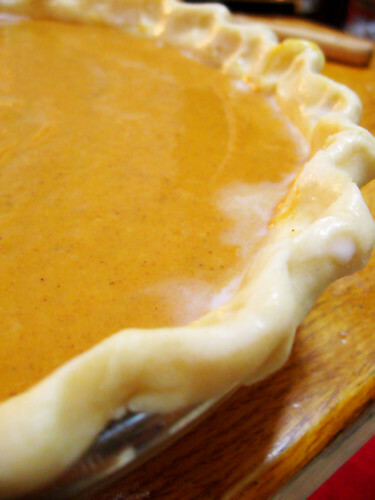 Perfecting pumpkin pie from scratch. This class includes a full Thanksgiving meal! After learning how to roast poultry, whip up potatoes and prepare a pie, I’m sure you’ll get a bit hungry. So, we’ll just have to our money where our mouth is and eat this food we’ve made! AND THATS NOT IT! There’s also a give-away! One lucky student will be the recipient of a brand new Reston Lloyd Calypso Roaster Pan with Rack courtesy of Cookware.com! and an afternoon of fun in the kitchen with a few other fun foodies. This will be an intimate event: the class only has four spots open. Aprons, ingredients and kitchen tools will be supplied. We want you to just relax and have fun hanging out while you learn. So, what are you waiting for? Reserve your spot now! Spaces are very limited. **INTERESTED IN CHRISTMAS COOKIE BAKING? Christmas Baking Bonanza: Cookies, cookies, fudge and cookies! Sat. Dec. 4 12 – 4 p.m. $40 Reserve now! Learn the craft of holiday baking and go home with a mixed grab bag of delicious cookies! 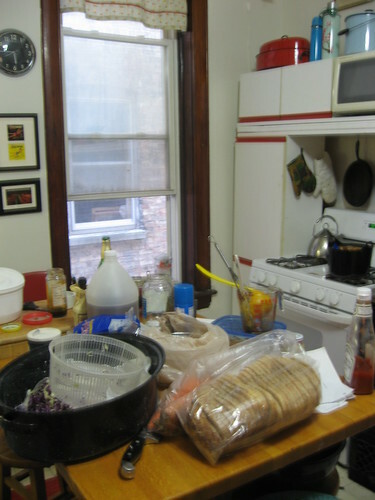 This week, TimeOut Chicago is featuring my kitchen as part of an urban essay on the conundrum of city kitchen Counter Culture, or lack there of. Katherine Raz, editor of BackGarage.com, hailed as the Apartment Therapy for the Great Depression, is master at finding high design in low places. Here she investigates how we used “salvaged remnants” to expand our cabinet and counter space. Interested? Of course you are! Read more to find out how you can do it too! Salvaged remnants! I love it. Much better then alley junk. Thanks Katherine! As any blogger, of course I am obsessed with my hits per day stats. 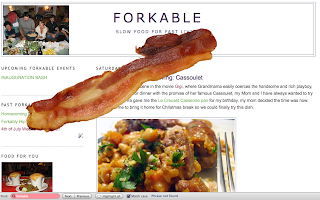 I was checking the list of linking sites bringing traffic to my blog and I came upon this weird link which when clicked, slaps a huge realistic slab of bacon all over my blog. You can scroll up or down, but the bacon stays. SO weird! Someone out there decided I needed a side of bacon on my website, so apparently, I’ve been greased. Everyone is talking about how bacon was a one of the hottest hipster food trends of 2008. I think its totally hilarious but I’m not entirely sure I get it. Is there more to this then just virtual bacon? Anyone? 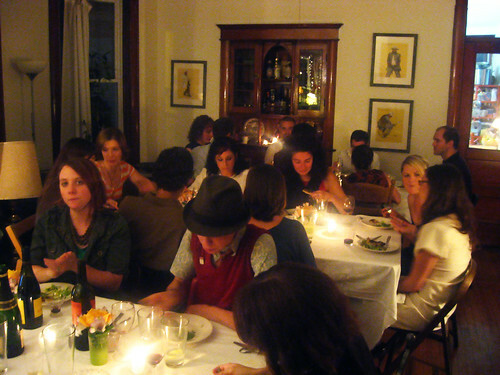 Are Supper Clubs the New Restaurants? Best of 2008 lists are all hot this week, and New Year predictions not far behind. Forkable was lucky enough to be mentioned in one prediction, stated by Time Out Chicago grouping us with Supper clubs such as Clandestino, Sunday Dinner, and Lush as a popular alternatives for adventurous diners on a budget for the upcoming year. Well adventurous diners, there are still seats available for our next Inauguration Bash scheduled for Sunday, January 18. If you are interested in reserving a seat, please send me an email. The Instructable’s Pie contest winners are in, and guess what?? The authors of these Instructables will each receive a hardcover copy of The Pie and Pastry Bible and an Instructables Robot t-shirt. Yours truly won the Judge’s Choice award! Omg, Omg! Yay. Yah, Yah! (I am a bit out of breath from jumping around!) I am soooo excited. I will be receiving The Pie and Pastry Bible, 704 pages of pie pleasure. We’re going to be making pies from now until forever. And, a robot t-shirt. Alright! Congrats! Girl with a curl for your winning Vampie Entry! OK enough about me. Lets talk about one of the 1st prize winners, a pie which will have you infected with deliciousness, at first bite! Its a Vampie! When I saw this, I along with everyone else had to vote for The Girl With A Curl’s awesome entry. As she says, this is a pie “your guests would love to sink their fangs, er, teeth into. Fresh strawberries are the “bloody” base for this sinful sweet!” Along her clear and thorough instructions are nicely shot detailed pictures to help you along. So pull out your cape and coffin, but no garlic please! Ahh. So I am up to my elbows in 20 lbs of potato salad and cole slaw right now preparing for ForkFest, my first food event tomorrow. The mayonnaise I just smeared all over my keypad is indicative of my lack of time to even wipe my hands off before typing this. Luckily, I don’t have to write a long post. 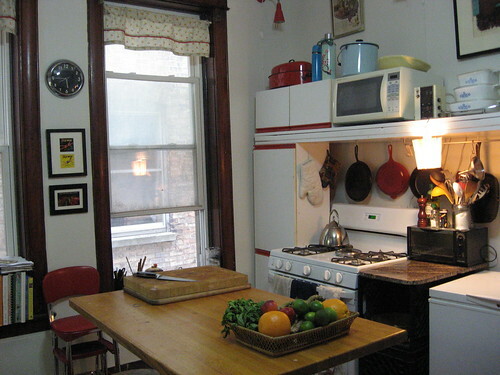 My good friend Katherine Raz, author of the urban design blog BackGarage.com, has just posted about my kitchen, spotlighting my Kitchen “Hacks” as a good example of manipulating urban spaces working within a tight budget. Wow, I didn’t realize how cool I am. Thanks Katherine! !